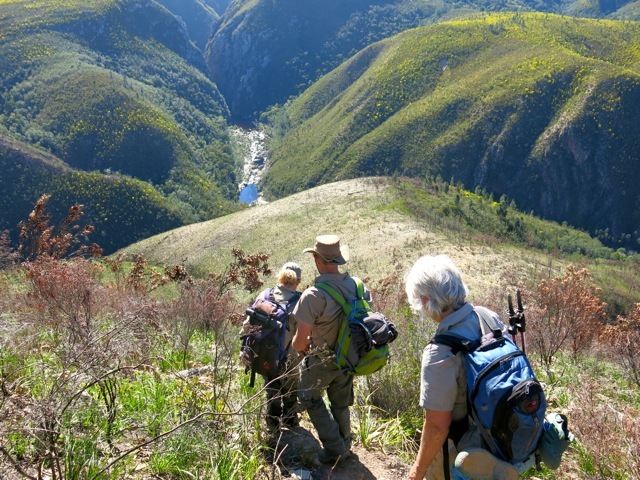 Hiking 400km in 20 days, following an old elephant migration path from Knysna to Addo Elephant Park, is a unique proposition. 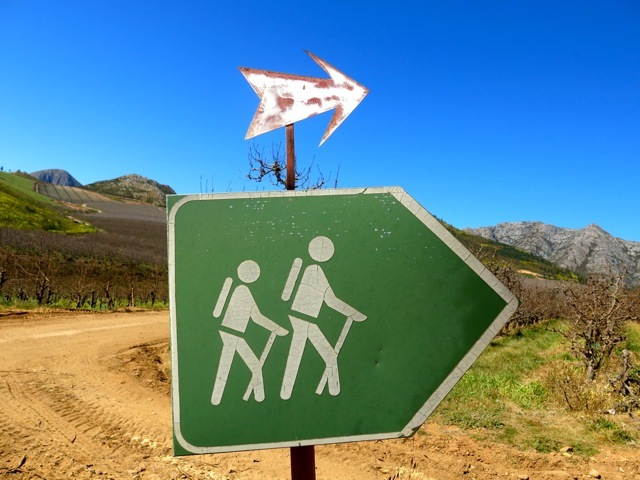 But being an intrepid South African I loved the idea and soon found myself kitting up for the Eden to Addo Corridor Initiative hike, with my Merrell boots, a down sleeping bag, all weather gear, hiking sticks, snacks, chocolates and blister plasters. The route is tough – you start in the Tsitsikamma forest, cross five major mountain ranges and hike in three awesome reserves, namely The Garden Route National Park, the Baviaanskloof Mega-Reserve and Addo Elephant National Park. The hike is part of a bigger conservation project that aims to connect these reserves with private farmland, in order to create biodiverse corridors for animals, insects and plants. The hiking is beautiful but hard – The dirt roads and trails often give way to dense bush that you have to hack your way through. Getting lost and orienteering is all part of the fun. The route is very mountainous, and we spent most days sweating up hills, bushwacking new paths or clambering down into valleys to cross rivers. Until the Karoo when the hike flattens out completely onto the Springbok Flats, before you reach Addo Elephant Park. To make the distance we averaged a distance of 25km a day – leaving early in the morning and arriving at the next camp in the late afternoon, sometimes dragging our heels in at 6pm. 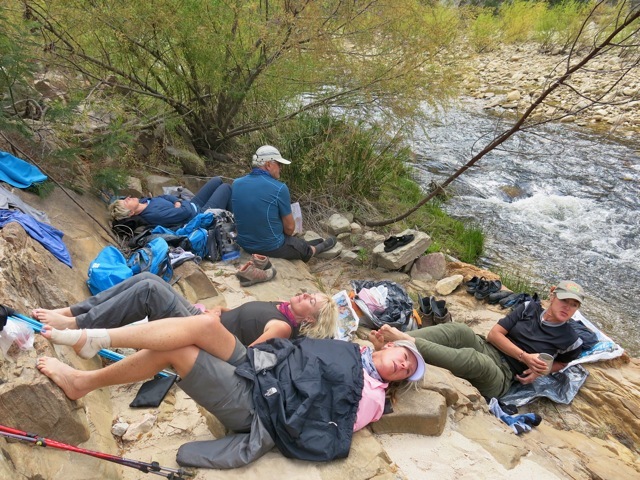 The best part of the day was the lunchtime siestas, usually under a tree and near water, but it was the change in daily life that meant the most to me – Getting away from cars, meetings and technology to sleeping in a tent, socialising around a fire, to watching the clouds and stars. The first few days were slightly neurotic, watching for blisters, nursing every ache, nervous about the distance, but it soon settled and I felt strong. Fortunately it is a slackpacking hike – that is we had a great backup crew that put up our tents every night, cooked all our meals and carried our gear. We only had to carry each day’s food, water and kit. 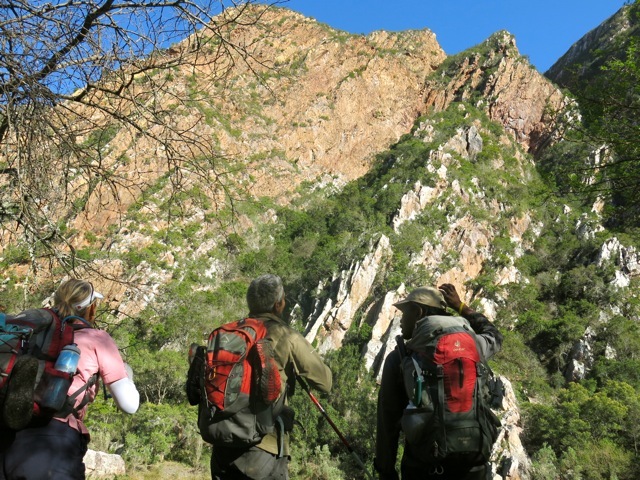 Although most of the hike is in pristine Fynbos, forest and succulent Karoo vegetation, it does cross tracts of farmland, and we experienced the conservation challenges of soil erosion and invasive alien vegetation firsthand. There is no other hike like Eden to Addo in the world – for its diversity and beauty. So, what impressions linger? Thousands of wildflowers, seeing buffalo, Kudu, black rhino middens, Black Eagles, the baboon that stole the box wine, swimming on hot days in icy rivers, majestic mountains, the beauty of the Baviaanskloof, feeling connected with nature, new friends, coffee around the fire, stretching out the day, delicious potbread, hospitable farmers, feeling physically tired and really,really happy. Eden to Addo here I come! Yahoo – life is that good! I want to go! Great photos! I just read all this…and a tear came to my eyes. Gone 40 years from Cape Town, left the day before marrying in Durban and four years later Los Angeles CA. Well you guys still have the most beautiful country and its so nice to see that you enjoy it in the most personal passionate way. I arrive in Cape Town on Nov. 20 th 2013 and will see what I can for myself one more time…..Best to you all. Ikey Architectural graduate 1971 Sea Point Boys High School 1964 UCT Anti Aircraft Regiment 1965 Youngsfield. Thank you Basil – I hope you create wonderful experiences and memories while you are here! Welcome!